The competitive landscape of the global LED video walls market is quite consolidated due to the dominance of prominent companies that are investing substantially as compared to the local and less popular service providers, says TMR in a recently published report. According to the report, the competition between the key players is expected to be on the rise, mainly because of continuous innovation and development of the LED video walls around the globe. The key players in the global video walls market are: Panasonic Corporation, Toshiba Corporation, Lighthouse Technologies Ltd., Optoelectronics Co Ltd., Delphi Systems Inc., Daktronics Inc., and Electronic Displays, among several others. According to the report published by TMR, the global LED video walls market is forecasted to expand at a healthy CAGR of 8.1% during the period from 2017 to 2025. While growing at this rate, the market is expected to reach a valuation of US$3882.9 mn by 2025 from a previous value of US$1967.2 mn in 2016. Rental based services of LED video walls has captured the top spot as a leading segment in the market. The is mainly due to the steep upfront cost required for setting up the LED video walls, which further leads to more consumers to rent out the walls. As per the TMR report, this segment accounted for about 53% of the total market share. Availability of custom-sized video walls along numerous standard layouts with regards to their designs is another reason for high demand of the wall rentals. However, the installation service segment is expected to show a good growth curve in the future for both European as well as the Asia-Pacific markets. This is mainly due to the growing demand of the walls for use in indoor as well as outdoor activities. From a geographical perspective, Europe is the leading market for the global video walls market, especially due to large number of sporting events, live concerts and corporate exhibitions being held in the region. 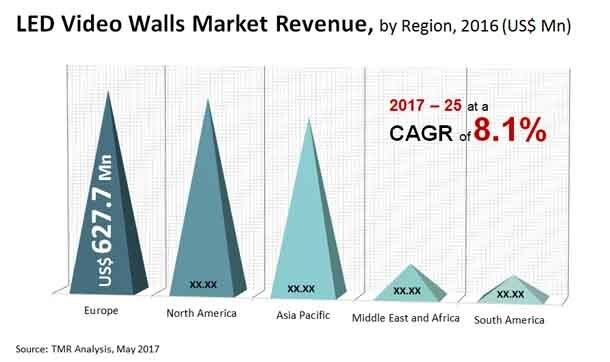 Even though Europe holds the top spot or the market, North America is anticipated to become a key region with a growing demand for the LED video walls market. The demand for LED video walls is expected to grow as a result of rise in numerous marketing and promotional activities, according to the TMR report. Live concerts, sporting events, stage events, etc. are few of examples of the sectors where these walls could see high utilization. LED walls also are available in various customized sizes, resolutions and other features, which is further expected to cause rise in their demand. Another prominent driver for the LED video walls market involves the ability of walls to resist outdoor conditions and still give high definition visual outputs. Due to this characteristic, many businesses prefer using these walls for outdoor events, which further propels the market. A prominent roadblock for the global LED video walls market is the large initial cost of investment. High expenses may cause small and medium-scale businesses to stay away from investing in the video walls, thus existing as an obstacle to the market. However, as technological advancements keep on occurring due the persistence of key players, low cost and energy efficient LED video walls might soon be available. This can certainly lead towards new opportunities for the improvement in sales of these walls.